Organic forum: What are you doing to reduce supplementation costs? Kathie Arnold — My response to the growing cost of supplementation is to focus on improving the quality and yield of our pasture and hay crop to reduce the need for grain. That is playing out ina three areas: harvest management, seed selection, and focusing more on fertility. With all of the recent research showing increased energy levels due to the reduced time baleage and haylage sits in a windrow respiring, we are trying to do “hay in a day” whenever possible. Other than pasture, haylage is the main forage for our milking herd. We mow in wide swaths with crushing rolls backed off as far as possible, as research has shown that leaving the stems whole facilitates quicker drying for baleage and haylage by allowing more moisture to flow up the stem and out the leaves. Crushing only seems important when we want to dry the crop all the way down for dry hay. Just prior to chopping, the cut hay is merged after having had the benefit of more sun and air exposure given the greater surface area in the wide swaths. This year the weather didn’t always cooperate for us to do all the haylage in a day, but we did pull it off for much of third and all of fourth cutting haylage, along with much of our baleage. Since we have yet to open those bunks, we don’t know whether this year’s crop will be noticeably better. This year I also focused on earlier harvest with less time between cuttings. Thanks to the early start (May 23) and the plentiful (sometimes more than plentiful) rain we’ve had, we’ve been able to get four cuttings on our best land where we normally would have taken only three. We’ve just started feeding first-cutting haylage with 20% crude protein and .70 NEL – if only all our haylage could be this good! As we look to renovate some pastures for better yield, intake, and quality, I am selecting seed that will give us pasture and hay crop plants that are both highly palatable and higher in energy to enhance both total intake and energy intake from pasture. 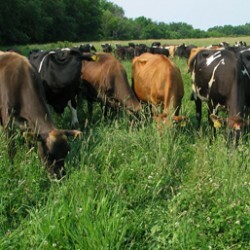 We have been pleased with the seed offered by King’s Agriseeds of Ronks, PA. We are very impressed with a mix (“Dairy Green Organic Forage Mixture”) that we seeded some pasture down to last year. It’s a mix of meadow fescue, ryegrass, timothy, red clover, and white clover. Its re-growth this year (with plenty of rain) has far exceeded any other pasture on our farm. I seeded one river-flat hayfield down to “Tivoli” ryegrass and white clover to see how it will do in providing a high-energy haylage crop. It doesn’t have the height of adjacent alfalfa/grass fields, but is thicker than the hair on a dog. In another new seeding on ground with more gravel, I tried “Barolex” tall fescue with alfalfa. Testing shows Barolex to be very high yielding, able to take abuse from traffic, and good on the energy side. I have had an aversion to trying more tall fescue after planting “Barcel” several years ago in some pastures, and being very displeased with the amount of grazing rejection by our cows. But this field will never be grazed, the Barolex should fill in over time as the alfalfa dies out in the more poorly drained areas of the field, and we should get better yields throughout the year compared to my usual choice of alfalfa/timothy. On the fertility side, for the first time we had a number of our pastures and a few hayfields sprayed last spring with “MPM,” a product from Lancaster Ag Products, Bird-in-Hand, PA. This is a blend of fish solubles (yes, it did have quite an odor), compost tea, seaweed extract, trace minerals, etc. Our milking herd pasture intake this year is as high or higher than it has ever been, even though we have more cows on the pasture system. It’s hard to tell whether this is partly due to the MPM, or just the never-ending rain. If the fields are dry enough, I also intend to do some dry blend fertilization this fall to address boron, sulfur and other trace mineral needs – something we haven’t done since being organic – as well as addressing calcium needs. These efforts are all to the end of producing more nutrient dense pasture and hay to reduce the need for supplementation. Kathie Arnold milks cows near Truxton, New York. Forrest Stricker- Feed costs are our biggest expense. Due to dry weather last year, our purchased feed bill was $140,000 on 115 lactating cows plus 80 heifers. We are doing all we can to reduce that cost! To increase our forage quantity and protein content, we seeded more clover to both hay fields and pastures. This year we used three seeding methods. We frost-seeded some pastures, and we no-till drilled some pastures and hay fields. Third, we used a “Gen-till” to open and aerate the ground, and then broadcast clover seed. With each method we seeded a mixture of 2 lbs. of white clover and 5 lbs. of red clover per acre. Every method turned out very well, with negligible differences in the health of the stands. After establishment, the clover comprised 30-40% of the stands. In pastures that needed to be renovated, we planted 3 bushels/acre of oats and 3 lbs./acre of turnips in March. This was grazed twice, then planted to BMR sorghum-sudangrass on June 1. This was grazed or baled three times, and by mid-September we planted an alfalfa/orchardgrass/fescue mix to these fields. Our overall plan is to increase yields and add nitrogen to our ground, which are two essential things for an organic farm. Last year, we knew the fertility was dropping where we removed hay, so after studying the soil tests we applied 5 tons of dry layer manure per acre in those fields. The manure not only added nitrogen, but many other minerals as well. Last year we made 300 (4-by-4 foot) bales of baleage; so far this year we’ve made 930 bales and counting. That’s a savings of $60,000 worth of purchased hay, assuming last year’s transportation prices from the Midwest. I estimate that half the increased yield was from the clover and increased fertility, and the other half from plenty of mid-summer rain. To increase the digestibility of our baleage, we tried to harvest the hay as close to the time of cutting as possible, as recent studies indicate that you save feed value by doing this. In the past we mowed the crop into a narrow swath one day and baled it the next day if it was fit. This year, we disc-mowed our fields and left the forage in wide swathes for four to eight hours to allow maximum surface area for drying to a moisture content between 50-65%. Then we raked, baled and wrapped – all in the same day. This should increase our milk production and cut our grain feeding. We’ll find out this winter if the extra raking and hustle was worth the improvement in quality. We started feeding 2 lbs./cow/day of molasses to increase the energy content of the ration. One pound of molasses will replace 3-4 lbs. of corn. Organic corn is $0.13/lb., and molasses is $0.09/lb., so there is almost a five-fold savings by using a small amount of molasses. And compared to corn, molasses is better for the cow’s rumen. In addition, we always had minerals and corn “fines” left over in the trough when the cows were done eating, but now the trough is licked clean. Sorting is no longer an issue, and the calculated ration is being ingested. The benefits of molasses keep mounting. To save on grain feeding to six-month and older calves, we are now feeding them high-quality baleage – not haylage. Nutritionists say that haylage heats up too much during fermentation, resulting in larger nutritional losses during storage. The calf ration is free-choice minerals and baleage testing 18% crude protein, with no supplemental grain. Since implementing it last winter, we are very pleased with the results of this ration. Going onto pasture this spring, they were the largest and healthiest heifers we ever raised. Our philosophy to reduce supplementation costs is to have high quality pastures along with balanced soils producing high quality, high quantity and highly digestible forages. This will reduce purchased hay and grain costs, while increasing milk production from healthier cows. Forrest Stricker milks cows near Wernersville, Pennsylvania. Rick Adamski- Growing corn silage this year is a radical departure from past practice, as we had not grown any corn for about 10 years. The decision was made after a financial analysis of the impact of what amounted to a “perfect storm” in 2005. The two “fronts” of this storm were the tremendous spring 2005 winterkill in our pastures, and the high organic corn prices. We had not planned for either, and our poor response to these problems resulted in it costing us more to operate the farm in 2005 than what we received from all farm income. Even though we had not grown corn for more than 10 years, we had purchased corn silage in almost all of those years. We were not organic for the first six of those years, so we were able to buy the silage from a grower within a half-mile of our farm. When we started the organic conversion we had to travel up to eight miles, and those fields had poor yields. We custom-hired the harvesting, so the hauling was very costly. For the two years prior to 2006 we tried feeding just baleage and dry corn. When the price of corn hit $7/bushel we tried to feed as little as possible. This hurt overall milk production. We tried feeding other grains, but did not see adequate production. Winter kill hit many perennial forages throughout eastern Wisconsin in spring 2005. While not killed, our fields were hurt enough to seriously slow early growth. The first crop hay harvest was just over half of what we expect in a “normal” year. The rains came late in summer and continued throughout the fall to produce some great fall forages for grazing, but our spring-seasonal calving herd had already peaked in milk, and we were just trying to level off production in the latter part of our lactation curve. These difficulties led us to evaluate our situation. We became aware of the Dairy TRANS financial analysis program last winter, and decided to use this tool. The analysis we completed for 2005 showed a strong need to improve our farm’s financial performance. It appeared to us that the productivity of our assets was inadequate. We wanted to improve on the amounts we produced from these resources. One problem: our pastures were under-productive. This, along with the concern about high organic grain prices, led us to begin evaluating the possibility of growing corn silage. Our past experience with feeding silage showed that we could reach a per-cow daily peak of about 70 lbs. of milk instead of the 60 lbs. per day that we saw without corn silage. As of today (Sept. 7) the corn is not harvested, but it looks very good. I am projecting around 15 tons per acre, or about 5 tons of dry matter per acre. I also estimate the corn will yield at least 100 bushels/acre, so there should be about 5,500 pounds of grain and 4,500 pounds of forage. I purchased some organic corn for $6 per bushel, and I estimate the forage in the silage to be worth $125/ton. The grain value of the silage is thus about $600/acre and the forage value is about $280/acre, for a total feed value of $880/acre. As a comparison, our pastures yield about 4 tons of dry matter per acre, which I figure is worth about $150/acre. Total pasture feed value is thus $600/acre. I believe the input costs for everything related to growing and harvesting this corn are much less than the $280/acre difference in value between the corn and the pasture. I also believe that corn silage and pasture will complement each other better and result in better production than if I was to feed only one of them. The greater feed value of corn silage gives it an advantage over another option, sorghum-sudangrass, especially if we can control the weeds as well as we did this year. I’m still focusing on grazing. Of our 220 acres, 26 are in corn silage. That seems to be a good amount for our herd of 65 cows and their replacements. I see that we will have a long-term rotation in which every part of the farm will grow corn once every seven to eight years. This will help us in re-establishing legumes in our pastures. Rick Adamski milks cows near Seymour, Wisconsin. Ernest Martin- Long ago and before we were organic, we decided that if we wanted to be profitable and compete with the huge dairies, we would have to run a low-input operation. We have found that there is more room for error if we don’t have a couple of thousand dollars going out in feed costs every month. We could probably push production quite a bit, but would that improve the bottom line? In addition to the higher feed costs, there are hidden costs such as shorter cow life, higher veterinary bills and lost income through not having as many heifers and breeding stock to sell. Now, to the question that’s been asked. For the past 10 years we have been trying to breed a cow that will work in a low-input operation. This has led to cows that will produce a fair amount of milk with good components on a mostly forage diet. We feed 10 lbs. of ground ear corn year-round, with less than a pound of beans or field peas added in the winter for energy. At $5.00-$5.50 per 72-lb. bushel for ear corn, our purchased feed cost is less than a dollar a day. While there are those who say that buying corn at that price is too expensive, I still believe I can make more money growing forages instead of corn. If I grow 125 bushels/acre corn that is worth $5.60/bushel, that comes to a $700 gross per acre. Compare this to an easily attainable five tons of good quality organic hay at a conservative price of $150 per ton, which grosses $750 per acre. This forage is grown with a lot less in terms of input costs compared to corn. Also, growing a legume-grass mix builds soil by improving organic matter and overall fertility. This is mostly related to winter feed. 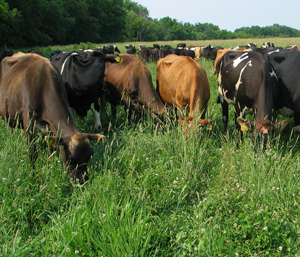 Where we can cut costs even more is by grazing as many days of the year as possible. With the exception of grain, we try to not feed any stored feed during the summer months if at all possible. While some people say that you can improve production and cow body condition by feeding corn silage, I would rather do this by breeding a more efficient animal. Also, we have been improving our soil with grazing. We have been able to increase the number of animals we keep on our farm while still growing all the forage we need, with some left over to sell. This has produced more manure to recycle on the farm, which in turn leads to more forage grown. While this will reach a maximum point someday, we have not yet reached that point. While higher energy costs are playing havoc with corn, soybeans and alfalfa costs for many dairy farmers, I do not see this as being a problem for our farm any time soon. In fact, I believe there are still some great opportunities to reduce fossil energy dependence. 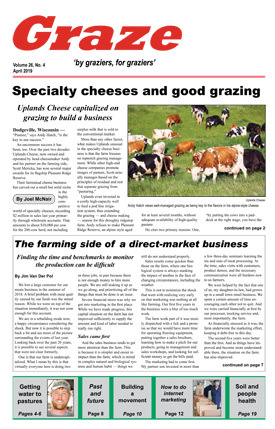 I’m also excited about the possibilities in organic grazing dairies that have not yet been explored. Ernest Martin milks cows near Shiloh, Ohio.